We left home only 2 days ago heading for the Baja but it feels like we’ve packed a week into those 2 days. It all started with getting up at 2:30 am and going to the airport. Actually, it’s the titanium hip that throws him into a different lineup each time we go through security. But, as you never know how busy it is going to be we were about an hour early for the flight. Last time we went, they were calling our names while we were still in the security line up. Flight to Calgary was good with a short wait. So far, so good. Landed in San Jose del Cabo and missed a part of the customs form so needed to go back and fill it out. That put us to the back of the line and what a line!! You start at one end of the terminal and wind your way like a snake all the way down to the other end. We were it is so long you started having conversations with the people in the next lanes as you saw them for about 45 minutes as you walked a good mile up and down the isles. We finally arrived at customs and got a smile and a nod and we were out in the main terminal. Wanting a rental car, we saw the rental counters and headed over. Then there was the matter of who would give us the best price and deal and finally settled on Enterprise. Now… the fellow we signed up with gave us a warning. Walk right through the next 2 sections (timeshares and taxis) as they will try and rope you in for a deal. So, ignore them and one of my fellows will come up to you saying they are from Enterprise. But first, there was the matter of turning dollars into peso’s as we didn’t have any, so we did it at the exchange at the airport. Then we heading on through. The first area we came to, there was a man saying he was from Enterprise, so of course, we went with him. After giving us lots of information, like don’t exchange your money at the airport as they charge you more than you would have to pay at an atm, turns out we got sucked into the timeshare web. As soon as he started trying to upsell me to things I didn’t want I realized that he wanted us to sign on the dotted line. I grabbed Rob and we tried to get away with the man running after us. We escaped to the next section where another man said he was from Enterprise and we thought “finally”. Only to find out we were now in the taxi section where he had a second cousin twice removed that had a timeshare and a boat. Did we want to go on a boat? We finally got away, literally having to grab our bags and run out the door and there we found a man holding up a sign saying Enterprise. At this time we’re a little gun shy but it turns out he’s the real deal and we wait for a shuttle to take us to the car. Turns out the office is just right across the street and we could have walked there faster, but it was obvious we were just babes in the arms when it comes to travelling in Mexico. I left Rob filling out the paperwork which took over 30 minutes to complete and by now it’s 4pm. I say this only because our plane landed at 1 pm so, between customs, timeshares, taxi, money exchange and car, we had been 3 hours and still at the airport. 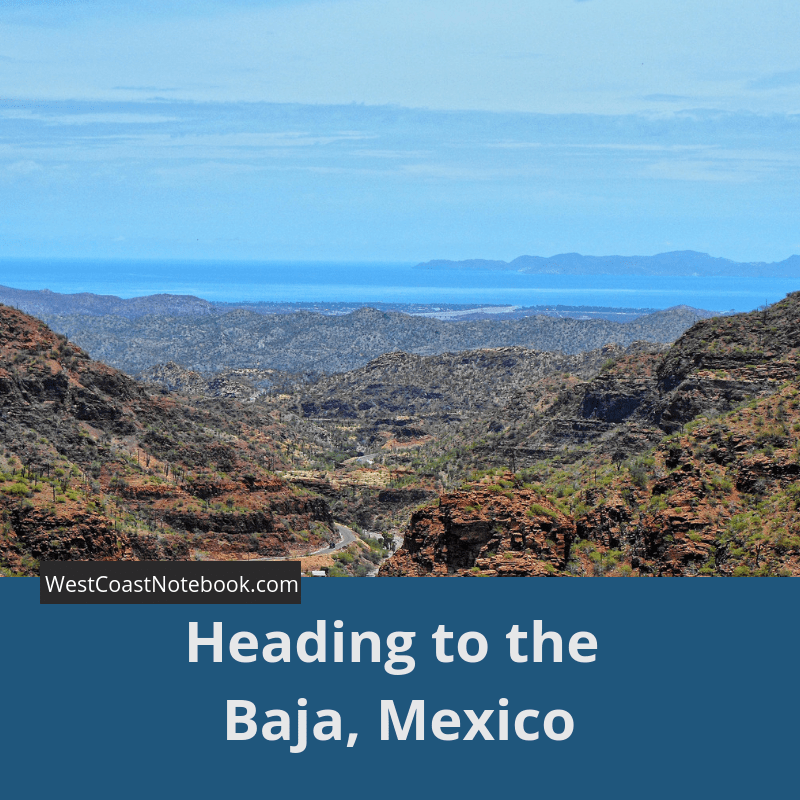 Now we have a car and are heading for San Jose del Cabo because there is an estuary there that I would like to walk around as there are birds. So, we figured we would get a hotel near there. Okay… so we never made a reservation before we left. Our bad. All we wanted was somewhere to lay our heads, that was clean, quiet and had a pool. We didn’t want the world or anything fancy. Round and round we went. Most places are all-inclusive and we figured out which ones they were pretty quickly as they all have manned gates to get into them. And… they don’t take people off the street. You need a reservation. So, scrap anything that was along the beach. Now it’s getting closer to 6 pm and we just want to relax, put out feet up and have something to eat as there was just cookies and pretzels on the plane. We were both so tired and Rob kept saying to me what about here… what about here and I finally said I just couldn’t make a decision I was so tired and burst into tears. Finally stopped where we thought we could get some food and use the washrooms. Used the facilities but it was a sports bar with the music blaring and as we both had headaches at this time we asked someone about a place to stay and were directed to Santa Marie Hotel. Finally found it via Rob skillful driving which involved U-turns and a wrong way street only to find out they only have 2 single beds. At this point, we were ready to take anything but we asked to see the room. Up we go, 3 flights of stairs and then up a fourth. Turns out that the room was on the 3rd and she had made a mistake, but we should have known from the 4th floor what it would be like. Actually, it wasn’t that bad. What I had seen on the 4th floor was chipping paint with junk strewn everywhere but when we got to the room it just had a really odd smell with board hard beds. Asking them to hold the room, we drove to a mall to get a topper so we could actually get a good night sleep. Nothing but a foamy so we grabbed that and found a spot to eat. We ordered 3 items and finally got one. That’s it. They never brought the other two, so Rob and I just shared what was there, paid and left. Now… keep in mind that while this was all happening, that we don’t speak Spanish and very few of none of the locals spoke English. It was like being in a farce. Feeling a little better after food, we headed to the car, ditched the hotel and headed to Cabo San Lucas. Boy… was that a mistake. First, there is a toll booth that you go through if you miss the scenic route. We pull up to the booth to pay only to have the lady yell at us to go back and we finally understood it was to press a red button. So, we backed up (no cars behind us) hit the red button and drove on. Only to find out at the other end that we should have gotten a ticket as well (below the red button) as that was how they charged us. But, as we didn’t have a ticket, we got charged double. No map, no GPS, no hotel, big city. We ended up in the old part of town with windy one-way streets and people walking here and there across the road. Rob saying… Where should we go… and I’m no help as I don’t know. By sheer luck, we found the highway and along it found a Comfort Inn. Saved by a hotel we recognized we took a room and started to put our luggage on a cart to take up to the room. A man asked us if we wanted help, but I said no, we could manage. All in mixed Spanish and English and hand gestures. But, it turns out if you take the cart you get him as well as when we pushed it into a little tiny elevator that fit Rob, me and the cart that you got the man as well who jumped in at the last minute and was so close to the door that it sprang open again. Now we are on the 2nd floor, gave the man his tip and flung ourselves on the bed. I fire off a quick note to everyone letting them know we’d arrive and we were asleep by 9:30 which is 8:30 in BC. And so ends our very first day in Mexico.